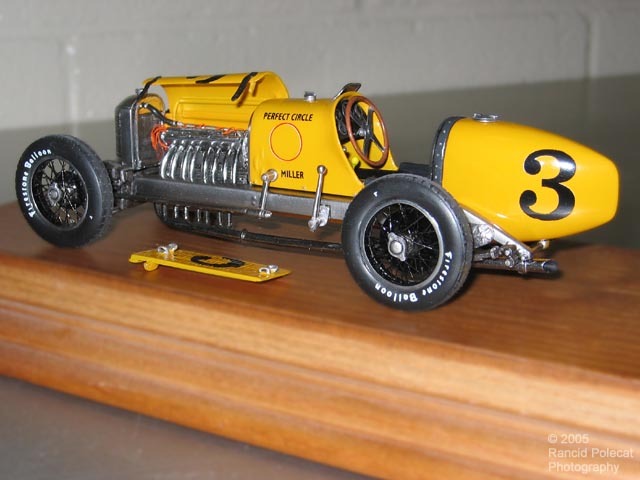 This is a replica of Pete DePaolo's Miller 91 C.I. Front Wheel Drive car as rendered by new club member Tom Faletti. And what a rendering it is. Anyone who's familiar with the Southeast Finecast of England 1/24 scale metal curbside kit that Tom based this build upon will recognize that he's put in a lot of extra work to make it look good and exhibit lots of detail. In the days when high-banked speedways were surfaced with wooden boards this Perfect Circle Piston Rings sponsored car acheived speeds approching 150 mph! DePaolo qualified third at Indy in 1927 with this ride, but a busted set of supercharger gears forced him out of this race after only 31 laps.